(NaturalNews) As the water shortage crisis in California rises to a boil, desperate farmers are coming forward to bid on the remaining steam. The Central Valley in California is indeed drying up, but private landowners who still have leftover water reserves on their property are now looking to cash in. A California water rush is on, as water is being auctioned for millions and aquifers are depleted. million from the auction of 12,000 acre-feet of water this year. Upon hearing the news, at least 40 other land owners have begun to prepare for a massive sell-off of their surplus water storage. 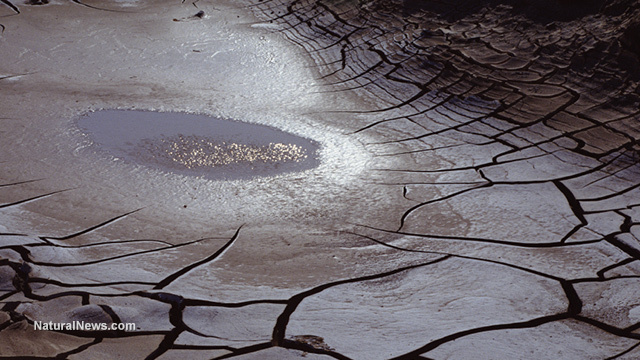 Drilling for water has become more important than drilling for oil, as water banks are drained at an alarming rate. The demand for California water is at an all-time high. In the past five years, the price of water has spiked tenfold. An acre-foot of water can now go for $2,200 in drought-stricken regions. As the aquifers are depleted to the highest bidder, it's only a matter of time before the less fortunate are put at the mercy of those who have a hand on the water tap. Some are calling on new state regulations to ensure that the water distribution remains transparent. "If you have a really scarce natural resource that the state's economy depends on, it would be nice to have it run efficiently and transparently," said Richard Howitt, professor emeritus at the University of California, Davis. Those auctioning off the high-demand water are private firms who hold claims on the underground commodity that date back a century. Underground caverns known as "water banks," where individuals store extra water for later use, are now being emptied as if water has become the new gold or oil. "This year the market is unbelievable," said Thomas Greci, the general manager of the Madera Irrigation District, which recently made nearly $7 million from selling about 3,200 acre-feet. "And this is a way to pay our bills." The water is quickly being bought up by the city of Santa Barbara, which has been struck hard by the water shortages. Other top bidders include almond farmers desperately needing some H2O for their crops. Underground water banks aren't the only sources being extracted from. A water district northwest of Bakersfield, California, announced that it would sell off water from the Kern River. The district claims its right to the river due to a century-old right-to-use law. The U.S. Bureau of Reclamation and the State Water Resources Control Board have documented at least 38 separate sales this year. The agency has set the maximum volume that can be sold, 730,323 acre-feet. This amount is about one-fourth of what the State Water Project has delivered to farms in previous years. There's obviously a more desperate demand than ever before. Anthea Hansen, general manager of the arid Del Puerto Water District, estimates that farmers will realistically pay on average $775 to $980 for an acre-foot of water in the year ahead.